An effort to honor local law enforcement officers kicked-off Wednesday with a brief ceremony at the Lewis County Courthouse. “I’ve been working on a way to show our appreciation for those who help to protect us and enforce the law,” said Lewis County Judge Executive Todd Ruckel. The ceremony was the beginning of a month long show of appreciation for those involved in law enforcement locally. 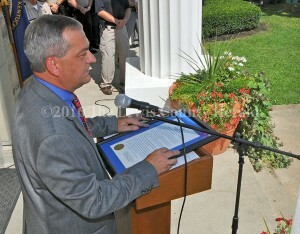 During the ceremony Ruckel officially proclaimed August as Law Enforcement Officer Appreciation Month in Lewis County. There’s a lot more to this story. It can be accessed by our digital and e-edition subscribers, and appears in this week’s printed edition of The Herald.